Seattle area sports might not be the first thing you think of when planning your trip to the region, but did you know that there are a ton of different sports for every fan in the family? If you know anything about Seattle, you're probably already aware of some of the major sports in the area. First of all, you can get your hands on some Seattle Mariners baseball ticktes, the local Major League baseball team (or take a tour of Safeco Field while the Mariners are on the road). Down the road you can take a Qwest Stadium tour, where you've got the local National Football League team, the Seattle Seahawks. First of all, don't forget my favorite sport: Soccer. Seattle has a great Major League Soccer team in the Seattle Sounders. If you're going to be in the Seattle area from March to September, there's a good chance that you'll be there for a home game. 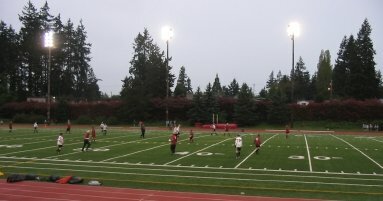 The games are held at Starfire Sports Complex in Tukwila (just south of Seattle), so the games aren't too far away. OK, so I love soccer but it's still a pretty mainstream sport. What about other sports you can participate in with the family? Well, believe it or not, even with all the rain that falls in the northwest, golf is an incredibly popular sport in the Seattle area. There are over 50 public and private 18 and 9 hole courses throughout the Seattle/Pugent Sound, so there's usually no difficulty in finding a place to play. Sometimes the weather might not cooperate, but hey, at least the grounds are always green! While golfing can be a lot of fun, it might not be for everyone in the family, especially if you're traveling with smaller children. In that case you might want to check out some other options that might be better suited for younger kids. Our kids, for example, love bowling. There are plenty of places around Seattle where you can take your kids for a fun night out on the lanes. But don't worry if your kids aren't in to golf or bowling, there are plenty of other Seattle area sports and activities to do, everything from going to the batting cage to skydiving to mountain biking. Whatever you choose to do, there are certainly many options to choose from. Back from Seattle area sports and activities.